Looks like Sprint's first LTE handset, the LG Viper, will be available for pre-order from Sprint beginning on April 12th for a reasonable $99 after $50 mail-in-rebate, and will be available in all channels "later this month." Last we heard, the Viper was said to be released on April 15th, but that seems unlikely with pre-orders beginning on April 12th. Guess we'll find out soon enough. NEW YORK--(BUSINESS WIRE)--In an exclusive media event to tip off NBA Green Week presented by Sprint, Sprint’s CEO Dan Hesse (NYSE: S) today announced pricing and pre-order availability date for the highly anticipated LG Viper™ 4G LTE, the first 4G LTE device with eco-friendly features to be offered by Sprint. LG Viper will be available later this month in all Sprint sales channels, including www.sprint.com, 1-800-SPRINT1, Best Buy andRadioShack for $99.99 with a new two-year service agreement and $50 mail-in rebate via reward card1 (excludes taxes and surcharges). New and existing customers can pre-order LG Viper beginning Thursday, April 12 at www.sprint.com/viper. LG Viper takes advantage of Android 2.3 Gingerbread platform, a 1.2 GHz dual-core processor, 1 GB of RAM, mobile hotspot capabilities and a 4GB card microSD™ slot that supports up to 32GB. It also features a 5MP rear-facing camera with flash and VGA front-facing camera allowing for a fun and easy face-to-face video chat experience. Enabled with Near Field Communication (NFC), LG Viper allows users to access true value features such as Google Wallet, an app that allows payment using a mobile device at participating retailers, including Bloomingdales, Toys “R” Us, CVS, Gap and Macy’s. The sleek, ultra-thin smartphone also boasts a 4-inch touchscreen that is remarkably bright and clear, even in direct sunlight. It also has a Corning® Gorilla® Glass screen protector for extra display resistance while on the go. As a Sprint ID smartphone, LG Viper will give owners the ability to cut through the clutter of more than 450,000 additional apps in Google Play by selecting from a variety of mobile ID packs. Sprint ID packs include ringers, wallpapers and widgets. Also, consumers can download Box on the LG Viper and receive 50GB of free cloud storage and sharing directly from LG, an estimated value of $240 per year, so users don’t have to stress about storing all of their favorite music, files, photos and other memories. The 50GB of free storage is exclusive to LG devices until July 22. 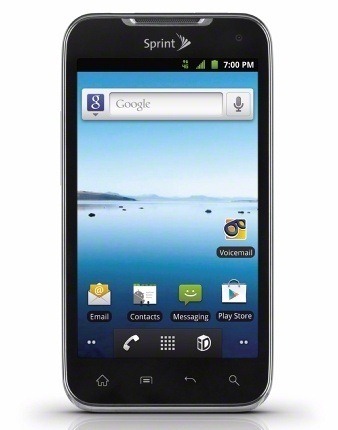 LG Viper customers can enjoy an unlimited data experience with Sprint Everything plans with data. Sprint’s Everything Data plan with Any Mobile, AnytimeSM includes unlimited Web, texting and calling to and from any mobile in America while on the Sprint Network, starting at just $79.99 per month for smartphones2 – a savings of $40 per month vs. Verizon’s comparable plan with unlimited talk, text and 2GB Web, or $10 per month savings vs. Verizon’s 450-minute plan with unlimited text and 2GB Web. The device is ULE Platinum Certified, the highest level of environmental performance recognized by sustainable requirements established by UL Environment and Sprint. It is protected by a casing made of 50 percent recycled plastics. It is RoHS compliant, meaning it is free from many potentially hazardous materials such as PVC, phthalates, halogens and mercury. The packaging contains up to 87 percent of post-consumer paper, uses soy ink, made with a glueless construction and is 100 percent recyclable. The phone also includes a charger that exceeds the EC Code of Conduct on energy efficiency when it comes to no-load consumption. Unlike other chargers, LG Viper 4G LTE’s charger only consumes 0.03 watts of power when plugged into a wall socket without being connected to the phone. Ranked No. 3 in Newsweek’s 2011 Green Rankings, Sprint is committed to being a corporate leader in sustainability. LG Viper marks the third device with eco-friendly features launched by Sprint and LG. Sprint and LG launched their first eco-friendly device in 2010 with LG Remarq™ and continued the legacy earlier this year with LG Rumor Reflex™. Sprint recently announced Atlanta, Baltimore, Dallas, Houston, Kansas City and San Antonio are expected to have 4G LTE and enhanced 3G service in mid-year 2012. Sprint 4G LTE should enable faster speeds for data applications, and the enhanced 3G service could offer better signal strength, faster data speeds, expanded coverage and better in-building performance. The launch of these large metropolitan areas demonstrates the continued commitment by Sprint to invest in its network through Network Vision. Whether a Sprint customer is using a smartphone to share a video, check the Web via a mobile hotspot, Sprint 4G LTE will make it easier. For the most up-to-date details on Sprint’s 4G LTE rollout, please visitwww.sprint.com/4GLTE. To complement the launch of LG Viper 4G LTE, LG is introducing the “Life’s Good Fairytales” app, a customizable storyboard that allows parents and children to bond over the creation and sharing of unique fairytales through their device. Families can become part of the fairytale by allowing them to take, upload and manipulate photos, names and sounds directly into the story, transforming the fairytales into the child’s own personal adventure. Thanks to the fast speeds of the LG Viper 4G LTE technology and Sprint 4G LTE network, stories can be read instantly and content can be shared with friends and family via Facebook®. The “Life’s Good Fairytales” app will be available Friday, April 27, in Google Play. It will be free for LG Viper owners and available for $0.99 for other Android phone users.